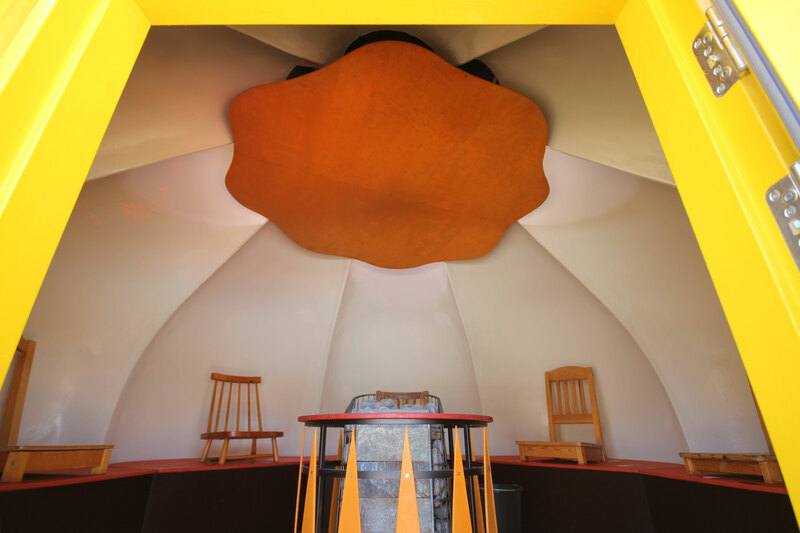 The Sounding Dome Sauna, is designed by Jan-Erik Andersson. 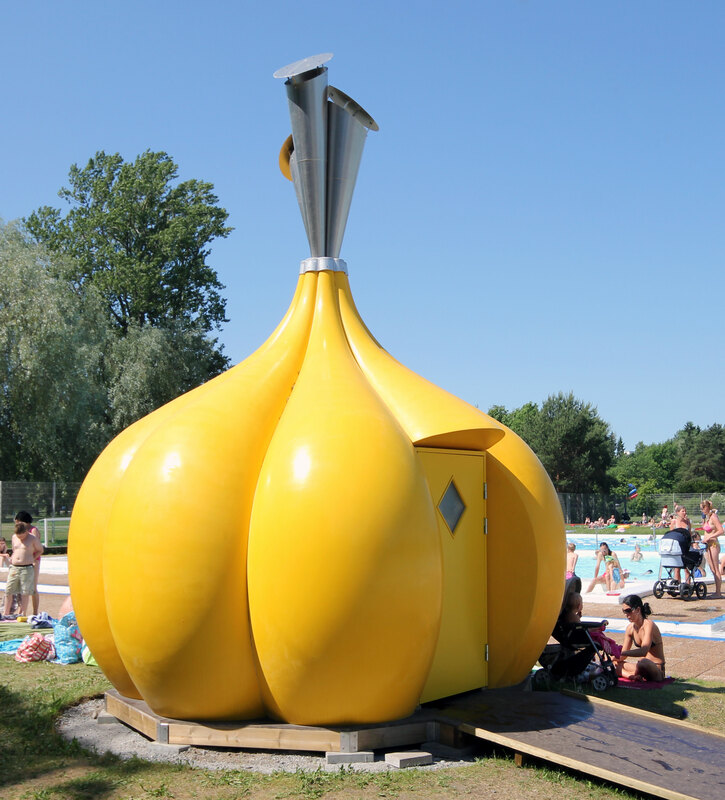 The project is one of several artist-designed and constructed saunas, which were part of the SaunaLab project, one of the many projects that make up the City of Turku Finland’s European Cultural Capital 2011 activities. 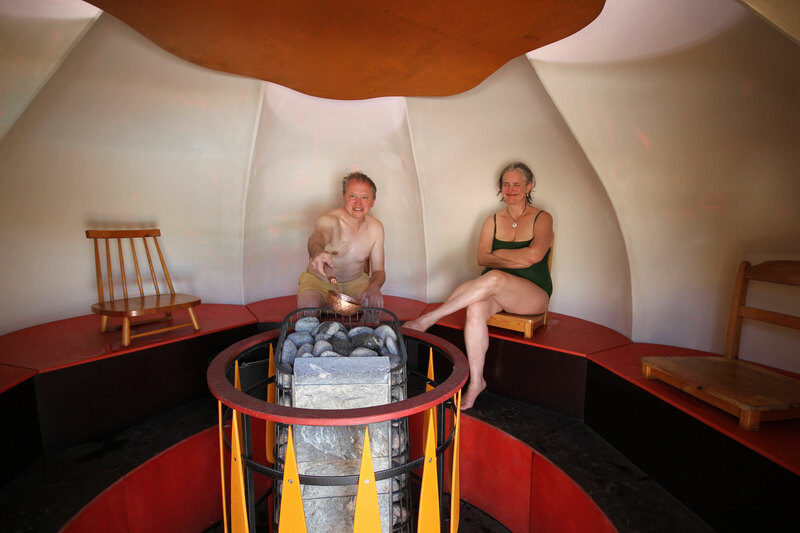 The sauna incorporates a soundscape created for it by the American sound artist Shawn Decker. The two artists have worked together since 1996 in many projects in art galleries, museums and in the urban environment. The sounds in the sauna change, once you throw water on the sauna stove! The sounds will emerge both inside and from the ”tops” of the “garlic”. The aesthetics of the sauna follows Andersson’s vision to bring more iconic shapes from nature into the built environment. It is inspired by the Orthodox church cupolas in Moscow and St Petersburg and was originally planned to be placed on the roof of a grey condominium house from the 60-ties, but was finally located in the historical Kupittaa Park in the outdoor swimming pool area during the summer of 2011. 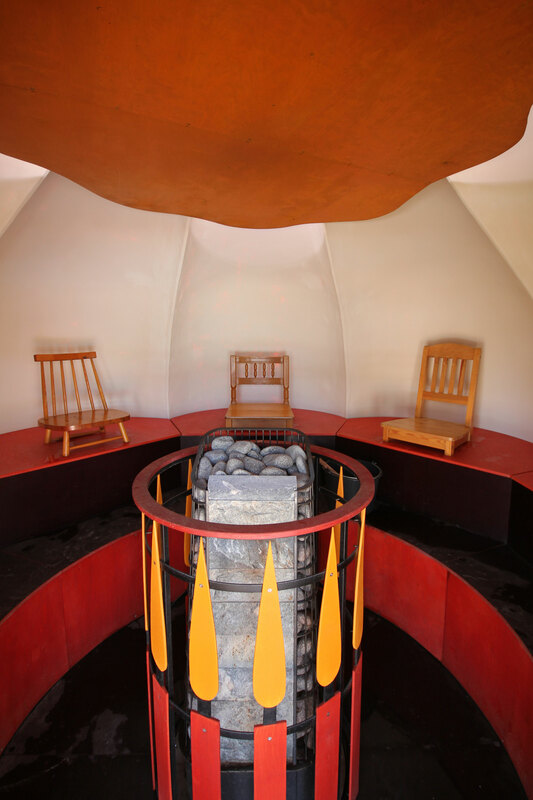 By using fiberglass for the double shelled wall, Andersson plays around with the tradition of wooden saunas. But in the interior he uses old second hand wooden chairs with the legs cut off to create individual seats for the visitors. Two chairs stand on the floor and can be taken out to give room for two wheelchairs. The soundscape, created by Decker, is driven by both the heat and humidity of the inside of the sauna. The outside sounds are designed to reflect the wild exterior of the sauna – whereas the inside sounds are more meditative and philosophical – reflecting the ”serious” nature of the Finnish sauna tradition. The inside sounds respond to the heating and cooling cycles of the sauna, via temperature sensors, with separate sounds for each cycle (”hot” and ”cool” drone sounds, elemental sounds such as water, wind, waves, etc.). The inside acoustics of the sauna also are important. People sit on chairs inside each of the ”cloves” of the garlic. The sounds are then transmitted down each of these cloves – which acts like an accoustical parabolic reflector, focusing the sounds around the listener. Many of the environmental sounds seem to come from behind you, and all around you as you sit in the heat – a very immersive experience. The outside sounds come from speakers in the metal ”horns” at the top of the sauna. They are triggered with the sudden gush of rise in humidity when water is thrown on the heater and these sounds evoke the wild exterior of the sauna, and are quite loud (teapots bubbling, steam valves releasing, large machinery turned on and ”winding up”, large ship horns, etc.). All sounds are produced from a set of 80 or 90 separate sound files that are mixed live according to the sensors, random choices, etc – so the sounds, while made up of the same elements, are always changing.